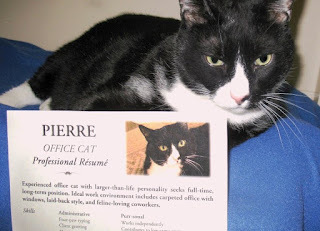 Pierre the Office Cat with his resume. He wants a job in your office. “Pierre is a dependable and punctual guest. He often serves as a trainer to our new volunteers and staff and is quite liked by all he meets. I would highly recommend Pierre for your available office cat position!" – Lindsey, ARF Animal Care Manager — at Tony La Russa's Animal Rescue Foundation. Salary desired: Medical benefits, litter box, bed, baths, food, toys, head and cheek rubs. Employee exercise plan required. Generous nap package preferred! 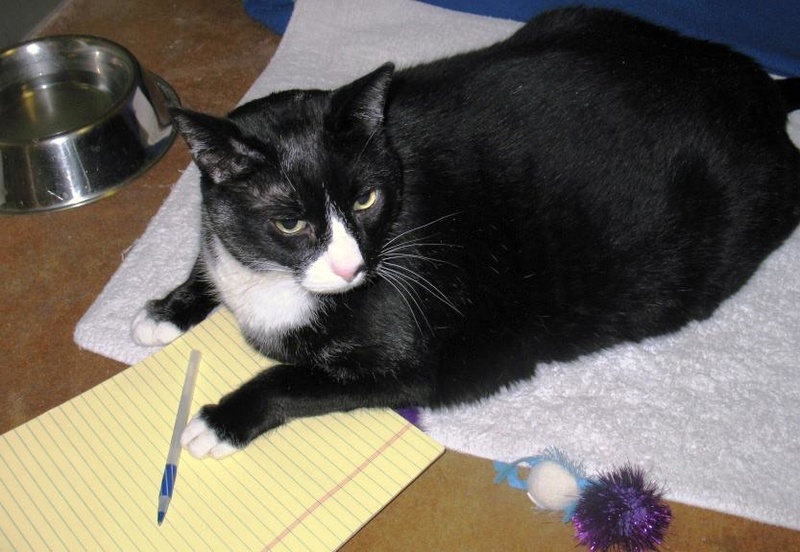 According to Mercury News, the animal rescue foundation decided to post Pierre's resume on the social media site when volunteers realized the tuxedo cat thrives in an open workplace environment. Maybe you can help Pierre find a job! You can connect with Pierre on Linkedin. You can learn more about Pierre at Adopt-a-Pet. He'll be hired in no time! Hired in no time as well. Have a fabulous Friday. He'd be Office Kitteh Manager in no time at all. With those credentials, no problem!! Maybe should do the odd workout to keep him in tip top!! Pierre is a highly qualified candidate for the position of Office Cat. We hope he finds a post soon! That is just brilliant! We bet Pierre finds a new gig real soon! What a cool kitty! I hope he gets his job soon! !